You can sort pivot table data in the same basic way that you sort an Excel list. Say that you want to sort the pivot table information by product in descending order of sales to see a list that highlights the best products. To sort pivot table data in this way, right-click a cell in the column that holds the sort key. For example, in the case of this pivot table, and assuming that you want to sort by sales, you click a cell in the worksheet range C5:C10. Then, when Excel displays the shortcuts menu, choose either the Sort Smallest to Largest or the Sort Largest to Smallest command. 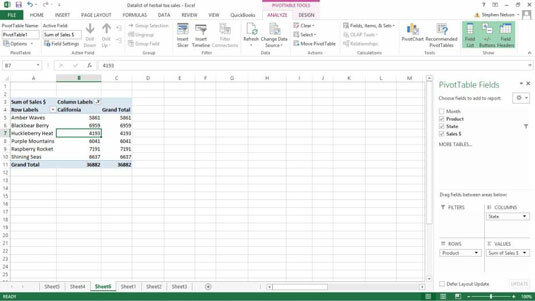 Excel sorts the PivotTable data. And not surprisingly, Raspberry Rocket sales are just taking off. Choose Data tab’s Sort command. 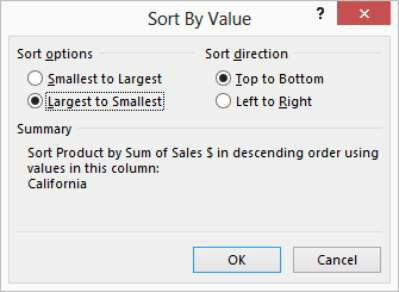 Excel displays the Sort by Value dialog box. You can select the Smallest to Largest option to sort by the selected PivotTable field in ascending order. Or you can select the Largest to Smallest option to sort by the selected PivotTable field in descending order. You can also specify the Sort Direction using the Top To Bottom and Left To Right buttons.